Many thanks to the History Hoydens for allowing me to guest blog today. I don't have a blog of my own (not sure I want one), but sometimes I just like to talk history with like-minded folks. So here I am. I have a thing for carriages. I don't know why. I assume they were uncomfortable and bone-rattling, no matter how well-sprung. I would not particularly like to have to rely on one to get around. And yet, somehow I love them. I love picturing my characters seated in them, or driving them. Especially the sporting vehicles. The sports cars of their day. 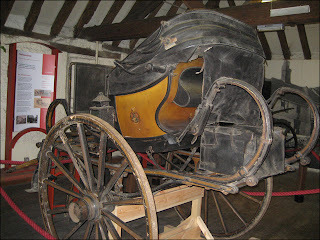 A couple of years ago I had the opportunity to visit the Carriage Museum in Maidstone. Greg and I were the only ones there, with the caretaker at our disposal, patiently answering all my questions. I was in hog heaven. I *so* wanted to be able to climb into various carriages, to know what it felt like, to imagine myself in a Regency gown trying gracefully to get in and out without showing too much leg. As accommodating as the caretaker was, he wouldn't go that far. Believe me, I asked! I spent most of my time studying a curricle from the late 1790s. That's the one I most wanted to climb aboard, because so many of my heroes have driven one, often with the heroine at his side. A bit of background before I talk about this specific curricle. The curricle, a two-wheeled open-air vehicle with a collapsible hood, was first made in Italy. French carriage-makers improved on the design, and it became extremely popular there in the early 18th century. It took almost a century for it to catch on in England, where in the last years of the 18th century it began to supplant the four-wheeled phaeton as the sporting vehicle of choice. There were many reasons for the huge popularity of the curricle. 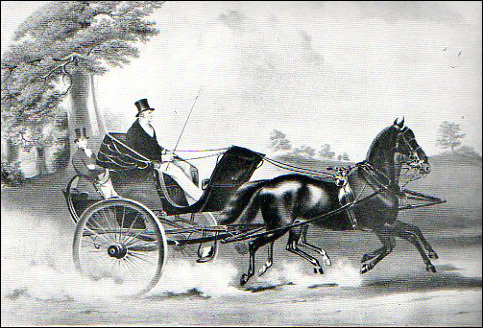 It was the only two-wheeled carriage at the time that allowed two horses to be driven abreast. 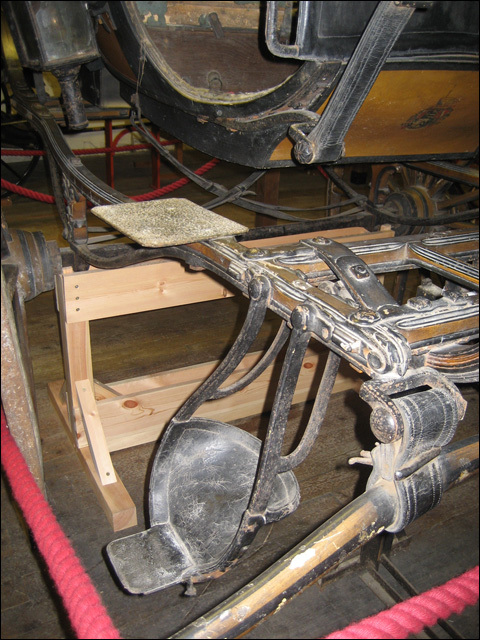 Instead of one horse driven between a pair of shafts (which was the usual method for a single-axle carriage), the curricle used a pole attached by springs to a special bar that lay across the saddles on the horses backs. The use of the curricle bar made it essential that the two horses be of exactly the same height and stride. That's why we always hear about men wanting "matched pairs" for their curricles. It was not purely for aesthetics. With balanced springs and a matched pair of horses, the result was an easy, buoyant motion – a comfortable carriage. The sleek design, though, did have aesthetic appeal. The rounded body was enhanced throughout by elegant curves: the dashboard sloping gently outward over the horses, the large C springs in the back, the scooped-out entrances. Hardly any straight lines to be seen. The earliest models were quite elevated, in the style of the high-perch phaeton. But by the mid-Regency, more moderate elevations became the norm. The curricle seated two, rather snugly, and there was often, but not always, a groom's seat in the rear between the springs, as seen in the print of the Marquis of Anglesey driving his curricle with a tiger seated in the rear. The expense, and difficulty, of finding horses matched in size and pace and of a quality suited to the curricle made keeping such a carriage only within the means of the wealthy. And so the carriage makers spared no expense in making the curricle as decorative as their clients desired. Dandies and Corinthians drove curricles in all colors and with all manner or ornament. Curricles required good driving skills, as they were prone to accidents. Because of the curricle bar, if one horse lost his footing, both horses could be brought down, and the driver sent flying. That's why curricle races were heavily wagered. At high speeds, there was bound to be an accident. Back to that curricle at the Maidstone Museum. It is decorated with the arms of Sir Robert Kemp, who died in 1761. However, both the museum caretaker and I agreed that it must have belonged to a later baronet, probably Sir William Robert Kemp, the 9th baronet, who lived until 1804. A curricle of this style was simply not being made in England in the 1760s. Based on everything I've read, I would date it to the 1790s. You can see from the first photo above that there is no groom's seat in the back. This sometimes required the placement of a quantity of iron in a box on the rear undercarriage to counteract the weigh of the driver, whose seat was slightly in front of the axle. I suspect heavy luggage might have served the same purpose, though it appears in this case that the box you see did indeed hold iron weights. Beneath the leather flap in the back, you can see the edge of the sword case. Even though it is the worse for wear, being over 200 years old, it is still an elegant-looking vehicle. Note the padded leather seats, the gadrooned wooden fittings, and the wonderful carriage lamp. There also seems to be a closed storage area beneath the seat. I like to think a gentleman would keep a pistol or two there, to be easy at hand if needed. Since I was not allowed to climb into it, I took a lot of photos and made a lot of notes in order to come to some understanding of what it would have been like to get into it. This is an early curricle, so it is one of the higher versions. The first thing one would have to do is step into the iron stirrup (one on each side) that sits about 14" off the ground. Entering from the left side, you would place your right foot in the stirrup. Next, you would place your left foot onto the metal plate that sits 12-13" up from the stirrup, and about 10" to the left. Then you'd have to sort of swing your right foot over and up about 6" onto the floor of the carriage. There are lots of things to hold onto while you climbed in, and I have no doubt a fashionable gentleman made a point of alighting with quick ease and grace. I think a woman in long skirts would have had more difficulty, but she, too, must have developed a special grace for entering all sorts of carriages. The lower curricles, like the one shown above with the Marquis of Anglesey, would likely have been more manageable, though the steady hand of a gentlemen would always be helpful. And it's a pretty tight seat for two, measuring only about 38-40" across. Very cozy for a ride through Hyde Park, don't you think? Great post, Candice. I have several reference books on period carriages, but your pictures really give one a better idea of what it was like to ride in one. I've only been to carriage museums in the US and have never seen a curricle up close. Thanks! I really like the photos and good research on the age of the particular model displayed. 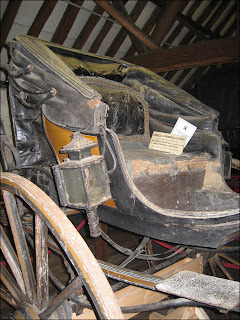 There is a prodigious amount of interest in nineteenth century carriages. My own post on the subject about the high-perch phaeton always draws quite a few looks. Thank you! Glad you guys found the post and the photos valuable. I'm hearing that we're having problems with the comment section. I'm so sorry. I can't seem to find anything wrong. Wow, how informative and helpful! I'm especially grateful for the photo of the metal stirrup and the details on exactly how one would get into a curricle. Thank you for the informative post, Candice. I would have loved to have heard a first hand experience of stepping into and exiting a curricle. Fantastic post with amazing photos! I never fail to learn something when you post on a subject, Candice! Thanks History Hoydens for having Candice do this! Always happy to yammer on about various historical topics, Louisa. Many thanks to the Hoydens for allowing me to use their forum. Truly interesting stuff. It's not the devil, it's the fascination that's in the detail. We're happy to have you any time you have something to want to "yammer" about, LOL! I've had the pleasure of driving horses (and getting run away with, too), and a well sprung carriage isn't as rough as you'd think. However, it's not like a car -- more like being in the sidecar of a motorcycle. You get the wind in your face, you can feel the motion of the horses (their pauses and forward pulls transmit to the carriage), and it's really more about the road. (Think also MG roadster where you're just about sitting on the road -- bumps and rocks and holes all become very obvious). But what's always amazed me is how women got in and out of these in long skirts without major snags. They're higher than you'd think (the shafts have to be high enough to fit comfortably on the horses), and there are plenty of places to catch a dress. I think you had to grow up managing skirts to really be able to do this without thought. How fascinating. I didn't realize they were quite so high as to have two steps. I don't know how a lady in a gown would have managed it. I'm too clumsy to have done it gracefully.